As the population of cities grow, the pressure on and crowding of infrastructure grows. Public spaces become stressful sites of sensory overload. 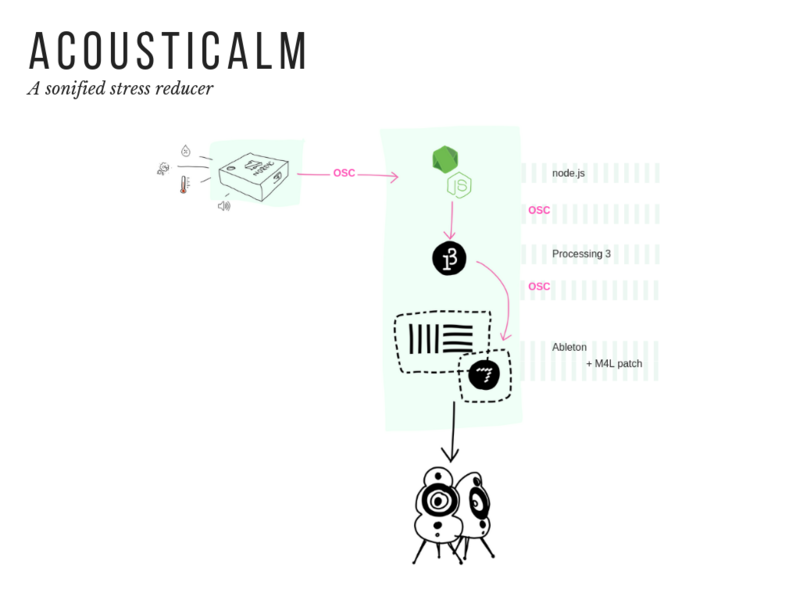 We want to identify the the stressful factors of a given environment and offer relief, a moment of redirecting the mind and calming the body with sound. We have created two use cases, each complementing the other. Imagine a busy commuter station at 8am on a Wednesday in July. Heat and humidity are through the roof, exhaust fumes are heavy in the air, and the noise of people, trains and announcements is building to a cacophony. As the factors of stress rise above certain levels, soundscapes designed to the specific levels of temperature, humidity and noise will fill the space. Heart rates slow, cortisol levels drop and your day is made a little better. We design sounds to match with the environmental conditions, layering natural sounds with ambient soundscapes. Using Ableton and M4L Patch the designed sounds will be triggered by the environmental data and transmitted on publicly installed speakers. 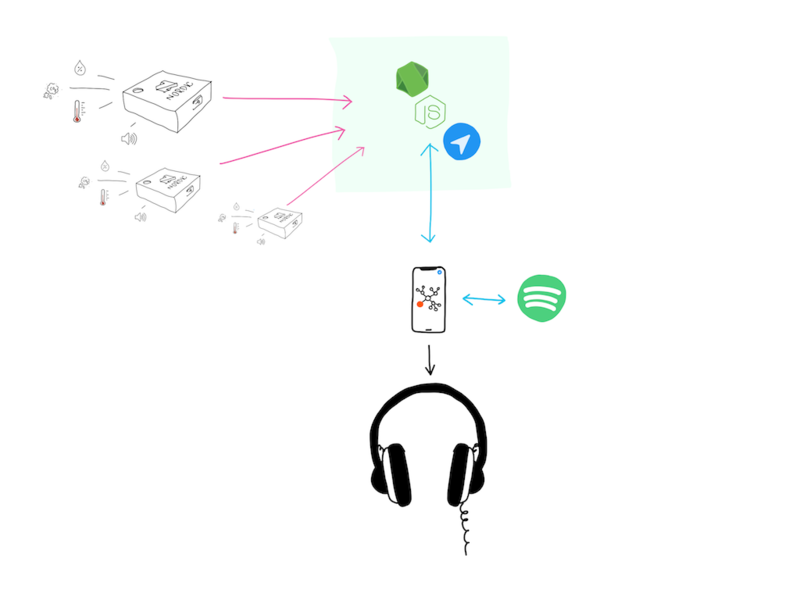 People will connect to their Spotify account using the Acousticalm mobile app which is location aware. The environmental data will be sent to the app according the mobile phones location and trigger a playlist of calming music. Spotify offers audio features such as acousticness, energy, instrumentalness, speechiness, tempo and valence. These measures are used to translate the environmental data into song recommendations within the user's personal genre choice. These were some of the considerations and steps we went through along the way. For public sonification we were conscious of the fact that the “Mozart effect” is not applicable across a culturally diverse population. Hence we decided on natural sounds, but layered with ambient soundscapes to make it stand out. We struggled some to make the device work. In terms of loudness, we could not get a reading of levels. Nor could we get a stable reading of temperature.